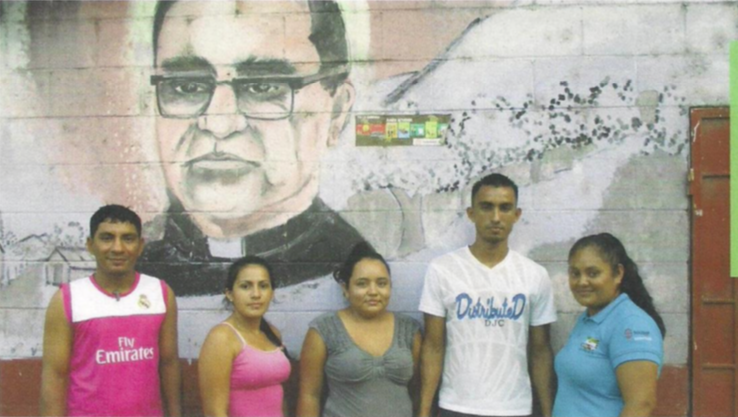 This letter from the leaders of our sister community of Las Anonas de Santa Cruz in El Salvado appeared in the recent newsletter of the U.S. El Salvador Sister Cities Network. They express their gratitude for our “uncon- ditional accompaniment” and ask for our continued support, especially now around the issue of sugar cane production that has a horrific impact on their health, their environment, and their animals. Please also hold in prayer the International Sistering and Solidarity Delegations and Gathering from July 17-25. Delia Landers will take part in a youth delegation and Joanie Brooks will participate in the delegation on climate change and food sovereignty visiting our sister community. Four other members of the Romero Interfaith Center will travel with us: Kim Daly, Carol Murray, Lance Laver and Nicola White. Please hold all of us, our fellow travelers, and our Salvadoran hosts in your prayers. All of us will carry your love and prayers with us to Las Anonas. We look forward to reporting back to you on all that we learn while away. On behalf of Las Anoñas de Santa Cruz community in San Vicente, we send a salute of solidarity to the big family of Sister Cities in United States, especially to our sister committee Philadelphia, hoping that God will bless your efforts towards social development and social justice. We are infinitely grateful for all these years of unconditional accompaniment from you to our community, as well as to many other sister communities in El Salvador. We feel satisfied for all that has been achieved by our communities and with the international accompaniment during these 30 years. The 30th Anniversary celebration is a good time to reflect and remember all of the struggles that we have over-come, in spite of the difficulties. Nonetheless, we still face other problems that affect the communities that live in the coastal area of our country, for instance San Vicente and southern La Libertad. Among these issues it is important to mention the harmful practices used in sugar cane production. Those practices are causing major negative impacts in the environment, the health of people and animals. For example, burning the sugar cane fields generates harmful amounts of pollution in the air, chemicals used on the crop eliminate the nutrients of the soil and pollute the few water resources that our communities depend on, and the unchecked use of water that is used to water the sugar cane fields is drying our underground aquifers. This is a concerning issue for the people who live close to sugar cane fields, since there are many people suffering from illnesses and even death provoked by those practices. It is with this in mind that we energetically invite the international community to renew your commitment in solidarity to accompany the struggles of the people in pursuit of a better quality of life and social justice. Thank you for helping us to keep the light of hope alive in a world of solidarity and justice.